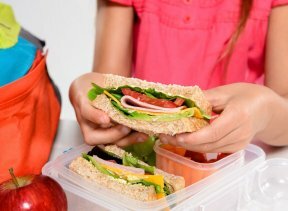 Another school year is about to begin, and for many parents that presents the challenge of trying to figure out what to pack in their children’s lunch boxes. Even boxes filled with loving care can contain cookies or chips or other easy, unhealthy options. A fun, healthy lunch or after-school snack – including a variety of fruits, vegetables, whole grains and proteins – doesn’t have to be time-consuming, stressful or more costly to put together. Have your child help in planning and packing their meals. When kids are involved, they are more likely to enjoy the foods they select. Consider these tips to packing a healthy, tasty lunch. Granola, fruit and nut bars – Read the labels for bars high in protein and fiber and low in sugar. Fruit skewers and yogurt – Skewers of fruit with a dip of high-protein Greek yogurt can be a delicious snack and help meet calcium requirements. 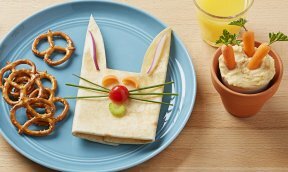 Bean dip or hummus and veggies – Kids love to dip, and what’s better than a protein-rich dip paired with grape tomatoes, jicama, baby carrots or red pepper strips? Apples or celery and nut butter – Slice up apples or celery sticks, and top them with your favorite nut butter and a sprinkle of dried fruit for a sweet and savory snack. For additional healthy recipe ideas, go to uhc.com/wellness.